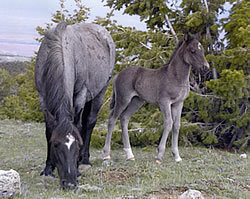 This is a photo I took this summer of Cloud's son and mother Sitka living in the Pryor Mountains of Montana. Unlike many areas in the West, sheep and cattle don't even graze in this area. So there is not even an economic interest in rounding Cloud's herd up. Eleven years ago I journeyed into wild horse country with a camera, great enthusiasm and zero knowledge about what made a "natural" horse tick. The journey changed my life. Through my experiences, I learned about the close bond between a stallion and his mares, about their rich communication and subtle, consistent discipline with the foals. And most important of all, I came to realize what wild horses value most ... family and freedom. fall's roundup. The herd has declined from over 200 horses to 135 adults today. They sustained an 11 % decrease last year alone, due largely to predation. Now the BLM wants the herd reduced to under 100. The population is already below the minimum genetic viability standards set by geneticists like Gus Cothran of the University of Kentucky. Overpopulation is not a problem! Underpopulation is! My fear is that if Cloud and his famous family can be rounded up - and perhaps even end up being slaughtered - then no wild horse is safe in the West. Please join me in Front Range Equine Rescue's "Save the Wild Horses"Campaign. It's critical that we preserve the American mustang for future generations to enjoy. P.S. I know many of you know me from watching the Nature Series on PBS. Cloud's herd is like a second family to me, so the thought of this herd being destroyed has me worried sick. Please help! Thanks so much!